Georgia’s spring practice is less than 24 hours away, and the running back position is loaded with talent, as four players could have significant roles this season. With that said, running backs coach Dell McGee will have a hefty task ahead of him as he will have to sort out which running backs will carry the load this season. Here’s a breakdown of each candidate at the position, and if they have a chance to crack the rotation. Nick Chubb (Jr.): The potential Heisman candidate will almost definitely take the starting role for the 2016 season. However, Chubb is still recovering from the PCL injury he suffered during last season’s Tennessee game. Therefore, he will not be able to participate in spring activities, and his status is up in the air for the start of the season. That leaves the door open for others to fill his temporary void, as he will be given time to learn the new system implemented by Jim Chaney before being thrown into action. 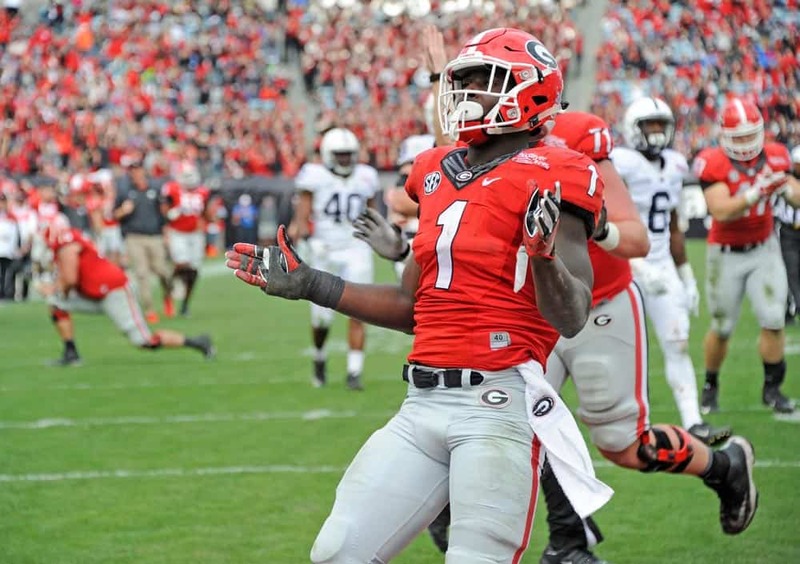 Sony Michel (Jr.): Michel is expected to fill Chubb’s void if he is out for any period of time, as he did for seven games last season. His carries will be limited throughout the spring period as a result, because Georgia can’t afford to lose an impact player to injury. However, don’t expect him to get a free pass, as he will need to learn Chaney’s system and become accustomed to the style of Georgia’s new coaching staff. Michel has been in awe with the changes Georgia has made, beginning with those in the strength department. Their motto “Attack the Day” used in their weight period is well-implemented by Michel and displays his work ethic. In addition to that, Michel had recently told the media that he has “taken a big step” for the upcoming season. The potential tandem of a matured Chubb and Michel creates great excitement for those around Georgia’s program. Brendan Douglas (Sr.): Douglas’ skill set is no surprise. He has played significantly in the past few seasons due to injury and a lack of depth past the top-tier players. However, the addition of Elijah Holyfield and potential rise of Tae Crowder makes it difficult to believe he will have a significant role this upcoming season. A.J. Turman (RS So. ): Similarly to Douglas, it is not believed that Turman will be able to earn a significant role for the upcoming season. Coming out of high school as a 4-star recruit, he had a lot of expectation and potential for impact. However, the injury bug had an effect on his ability to take the field. His injuries along with under-performance have limited him from touching the field to this point of his Georgia career. However, if he is able to fully display his skill set and shock the coaches, he could work his way into the mix, although it’s unlikely. Tae Crowder (RS Fr. ): Crowder is the player that Georgia fans need to keep an eye on. Crowder sat out last season to mature and gain another year of eligibility. It’s now his time to shine, as he has the opportunity to earn a significant role as the third or fourth guy. There aren’t many who know what he can bring at the college level. However, as a highly-touted recruit, his high school performances showed what he is capable of. If this turns to be true, it is rare to find an athlete with a team-first mindset. Crowder is nearly assured to compete for the final spot and give it his all. If he is able to show his potential, he will be a player that Georgia fans will be excited to see take the field in September.